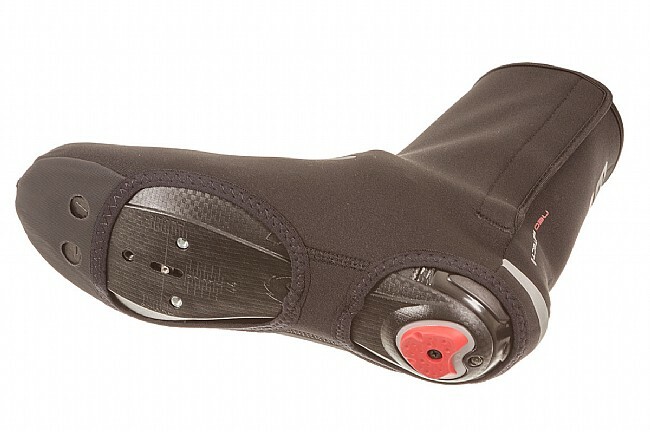 The Louis Garneau Neo Protect II Shoe Covers use tried-and-true 3 mm neoprene in a simple design that's proven and reliable. A strong Velcro® entry at the rear is durable and doesn't get mucked up, and reflective accents on the back and sides provide visibility. The toe is rubberized for additional durability with cutouts for spikes for serious winter use. These covers are cheap and great. They are not 100% water proof, but will keep you dry in light commuter spray. I had the black and foolishly hiked in them, chewing up the toes. So I got a pair of Neon yellow to help with the being seen. Sadly filhty city road spray dimmed the hot yellow pretty quick, but that's no fauly of the product. This shoe cover fits well and is easy to put on and take off. In addition it is warm and waterproof. My only issue is the bottom of the toe area. When I stop and put my foot down, my toe hits first and sometimes I stay on that toe causing more wear. The material on the bootie at the bottom of the toe is very thin and not durable. So now I have a pair booties that look new on top but will soon become unusable because the left one is worn out under the toe. I actually tried wearing some toe cover over these and had some success since the toe covers had a thick rubber bottom. In spite of all that I bought another pair because of the price and how well they worked before wearing out. I ride a recumbent. These are a nessassaty. These. The socks and toe warmers. And I'm good for any weather. I ride in Northern California, and when it gets to be in the 40s and 50s, my feet get cold! Not that warm, so it's not like sitting with your feet by a fireplace - ) At 40 deg, they'll still be cold. Overall I like them and am satisfeed. Very In pressed on how Warm my Feet stayed Warmed. Able to ride for a Couple of Hours at 50 degrees. Nice shoe covers for cold and rain. Good shoe covers for the rain and cold. They are not insulated but still do the job when it's cold. The price was excellent. I use these on the road only, so that may be why I don't have problems with the bottom wearing out like other riders. Unlike so many brands, Louis Garneau seems to fit true to size. I prefer the wide velcro strip on the outside of the ankle - it doesn't chafe the crank arm and works better than a zipper when layering wool socks and tights. 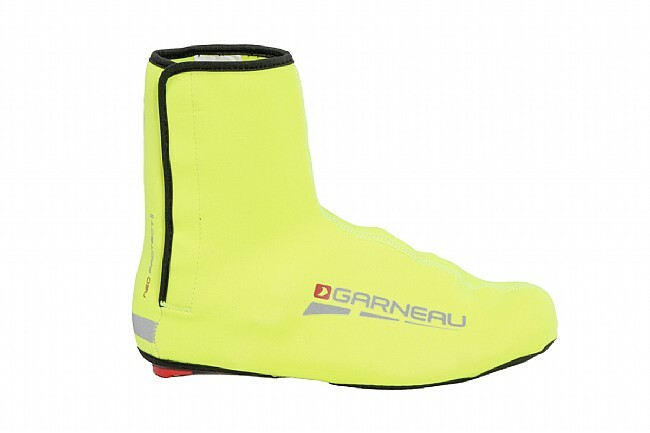 I have been using Louis Garneau Neo Protect II Shoe Covvers for several (winter) seasons now. Based on the harsh weather and my milage from Nov to March, getting 1 to 1-12 seasons from these is fine. I always wait for them to go on sale so to have a 2nd set ready to go when the current pair wears out. I hate the cold, but I hate not riding more. These help make it easier to ride, knowing my toes will be warm even when its 19 degrees, cloudy and windy. They also help when it is wet out, but not on down pours. 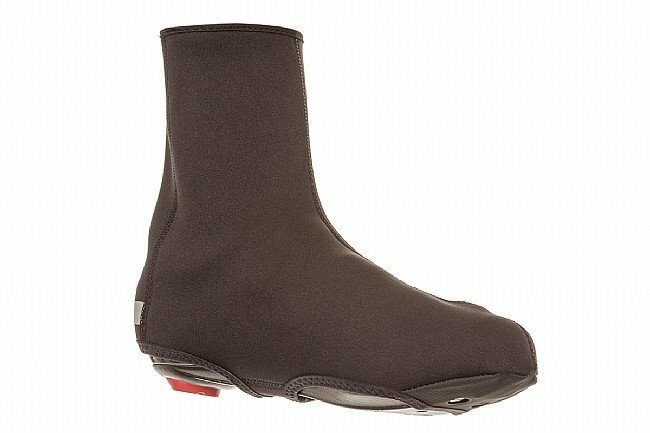 When my neoprene toe guards had failed to keep the feeling in my toes for the last time, I turned to BikeTiresDirect.com and found these. I wear them for sub-40F days, or if it's under 50 and wet. After many rides with them, I'm quite happy. I like that they fit tight, stay warm, and keep things dry. The velcro enclosure isn't as tighttidy as a zipper, but it's easy, and gives a little more pant-choice-thickness versatility than a zipper. I just threw away a pair of booties I used for one year because the zipper failed. I won't mention the brand but it rhymes with crap-o. Happy to find these basic booties with VELCRO. They're exactly what I wanted - nothing fancy and no zips. Got the neon yellow ones !! To be seen ! Great cover. Make sure your check sizing! Bought these in Medium to fit my Size EU42 shoes, Went right on my road shoes and provided excellent protection against the wind, rain and cold of November in NY. However, trying to fit the Medium onto my MTB shoes proved nearly impossible...I was afraid of tearing the bootie as it cleared the larger heel area. Ordered a size Large for the MTB shoes and they work without too much strain. Face it, these are not the most expensive shoe covers, but they serve well. If you ride a lot, they should be good for the winter season into early spring. The price allows for annual replacement. If you ride less often, these should last you a couple of seasons unless the hook and eye closures stop functioning. Easy to get on and off. Keeps my feet warm down to about 35 degrees. Seems like it should hold up for many seasons. I put these over my Keen biking sandals and they worked pretty well but, I only used them once and the straps across the bottom tore. I like how easy it is to put over my cleats. I was initially concern about standing up to the all walking around I do from the commuter cage to the locker room all the way to by office desk. So far one month hasn't been too bad. I've already assumed I'll buy a new pair annually because shoe covers aren't made for that much walking. At this price it definitely keeps you warm and dry. What else do you need? Product is stretch fabrics with overlapped fabric reinforcement for sole openings. The sewing quickly unraveled. If you can sew, reinforce the bottoms when new and you should be able to enjoy the product. Or maybe try fabric glue. Other than the bad stitching, they work fine. The are great I use them on the MTB in the mud. I use this pair when riding mud on the XC MTB. Feet are always dry and shoes look like new after the muddiest of rides.They do get torn up when riding the more aggressive trails, but for this price I just break out a new pair every year. I like the velcro opening over other zipper opening because I kept on breaking the zipper pulls off. These are warm, easy to put on, and keep my feet plenty warm in weather down to the 30's.